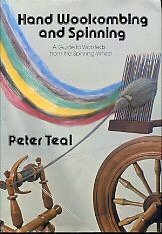 Several years ago I traded M some angora rabbit fiber and cotton lint for Peter Teal's Hand Woolcombing and Spinning. But it wasn't until I started working on this Leicester Longwool fleece that I actually took a serious look at it. I have finally decided to take the plunge and try my hand at wool combing. Mr. Teal's book is well suited for the beginning wool comber as it is very practical and down to earth. So it is a good resource for me. These range from 6 inches on the left to 10 inches on the right. I chose the 8 inch pile to start with as I seem to have the most of that. The fleece was given to me over a year ago and survived 2 long distance moves including being stored one summer on a hot un-air conditioned Florida porch. Because of this the grease was pretty tacky, so I decided to give it another wash. I used the little packet method Patsy Zawistoski recommends on her video, Spinning Wool – Basics and Beyond. I love this video because it has so much excellent information on it. I've watched it and my other spinning videos numerous times over the years, sometimes for specific information, and sometimes just to see if I can glean another tip to improve my spinning. I folded small groups of staples into nylon netting and secured each with a string. 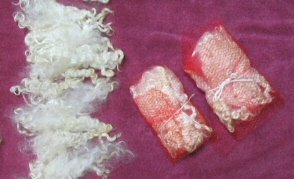 This maintains the integrity of the lock structure, which is necessary for woolcombing. I used the hottest water I could from my tap and added a kettleful of boiling water, plus a few squirts of Dawn dishwashing liquid. I then spread the staples out on a towel to dry. In the mean time, I'll review the combing process itself. 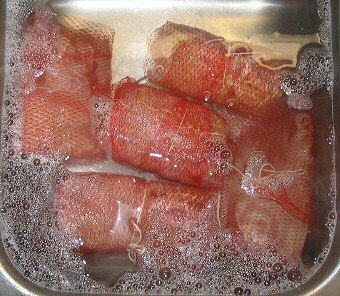 I learnt something new today... wash in a wee net and hot water. I'll give it a try on the jacob / french texil fleece I've just been given.